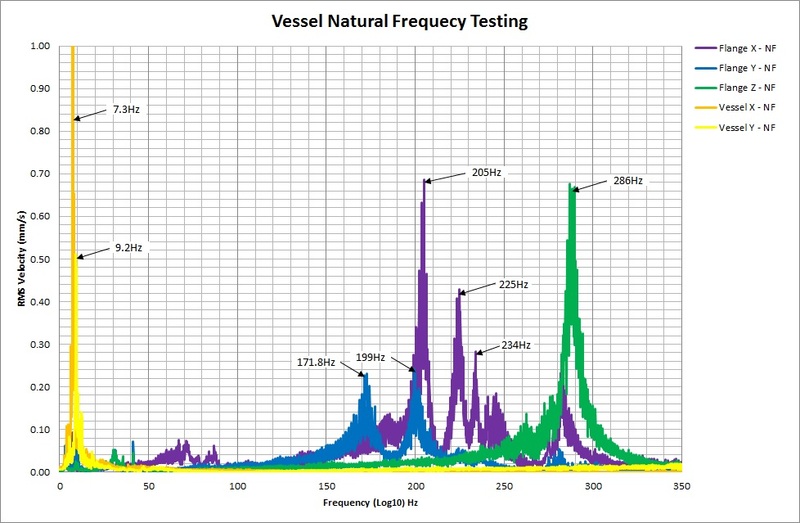 AVT Reliability is frequently asked to investigate problems caused by structural resonance. This is the name given to the dynamic behaviour of a structural item of plant or machinery when excited near to one of its natural frequencies. All structural systems having mass and stiffness will have multiple natural frequencies and mode shapes (which can be thought of as the displaced shape of the structure at its maximum deflection). If the structure is dynamically excited at or near any of these frequencies, the response of the structure will be amplified, resulting in larger than expected vibration and stress levels, potentially up to 40 or 50 times greater than if the same excitation force was applied statically. Broadband vibration over a wide range of frequencies which encompasses one or more of the natural frequencies. An example of such excitation would be flow-induced vibration within piping systems. 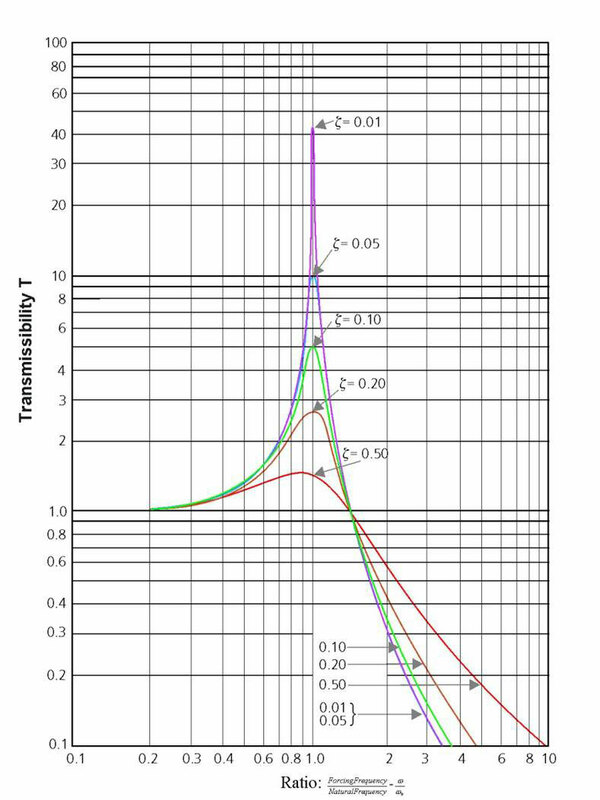 Tonal (pure sinusoidal) excitation which occurs at discrete frequencies, such as the running speed of a rotating or reciprocating machine, such as a fan, pump or compressor. Often such excitation will include higher order harmonics of the running speed, such that multiple discrete excitation frequencies could exist over a wide frequency range, some of which may be ‘close to’ a structural natural frequency. Impact related, which will generate continuous broadband excitation typically from zero Hz to several hundred Hz depending on the impact profile. Due to the amplification affect close to resonance, such structural resonance is responsible for the large majority of structural and machinery problems. Amplified stresses at resonance will have a massive effect on the fatigue life of a component. Typically fatigue damage in a welded steel connection will varies proportionately to the cube of the stress level, such that even a resonant amplification factor of 10, could reduce the fatigue life of a component by a factor of 1000! Similarly for machinery, such an amplification of vibration levels will often force the machine vibration to vastly exceed machine vibration alarm levels at those running speeds which result in the resonant frequency matching. The closeness of the excitation frequency to the natural frequency. As a rule of thumb, it is advisable to ensure that excitation frequencies are not within +/- 20% of natural frequencies (However, this is often not possible). Consider the case of a reciprocating compressor running at 360 rpm (6Hz), this will produce excitation peaks every 6 Hz up to > 100 Hz, such that any natural frequencies will always be within maximum 3Hz of the nearest excitation frequency. In practical applications, resonance will only be a problem if an excitation frequency is close to one of the natural frequencies. Structural resonance will normally result in disproportionately high amplitude of vibration at a particular frequency and in a particular direction. One of the easiest practical ways to confirm resonance is using an impact-response or ‘bump’ test. If a structure is impacted with a hard rubber mallet, it will experience broadband excitation which will result in an amplified resonant response at those frequencies corresponding to a natural frequency. This response will decay over a short period, depending on the structural damping. By measuring the frequency of such responses using a simple vibration meter it will be possible to quantify the natural frequency. By comparing this with the operational ‘problem’ frequency, it can then be determined how close to resonance the problem is. For machines, resonance will normally be related to the running speed of the machine. For variable speed machines, problems will generally only exist at certain ‘critical speeds’. As the speed of the machine increases, approaching a ‘critical’ speed, the 1 x vibration frequency will increase to a maximum at the resonant condition and will then decrease again beyond resonance. During the transition from the speed being below critical to above critical speed, there will be a 180° phase change. Use Dynamic Vibration Absorber to cancel out excitation forces.